Are you the type of person who wants to receive surprise gifts/packages at home? I do! Last March 17, work day went so fast as I kept on thinking the upcoming church retreat the next day. Little did I know that I'd be coming home seeing a huge Oishi paper bag and a heavy 24-bottle filled box. I thought, "Surprise, Glenn!" Without any bias or dishonesty (because this is not a paid entry nor was it requested to be blogged), most of the products that were sent to me are the ones we really patronize. A few of them were new, but majority are products we often buy from the supermarket. Smart C+ drink - Remember that I blogged about this a couple months back? I was all smiles upon seeing that I have 24 bottles of Smart C+ with 6 bottles of each flavor! Perhaps I'd be bringing a bottle every other day in the office. Yay! Wafu - Pictured above the Smart C+ box, this is something new to me. Neither have I seen it nor tasted it before. It's a box of 20 containing rolled wafer with creamy cheddar cheese and leche flan flavors. Pillows party size - Oh Pillows, how we love thee. Don't you think all big sized snacks/chips should resealable zip lock like this? For the uninitiated, Pillows is a chocolate-filled snack that is enriched with Vitamin A. Crunchy on the outside and chocolatey on the inside. Marty's Crackin' vegatarian chicharon - Without my mom's need to eat strict vegetarian stuff (no garlic, no onions, etc), I wouldn't have tasted this before. But when I did, I appreciated the inventiveness of Oishi in creating a product like this. It comes in Plain Salted and Salt & Vinegar variants. Ridges potato chips - I'm definite that most of us know this. Whether you like plain or sour cream flavor, both of this are great tasting. Bread Pan - This product has been my usual snack when I was in college. Having so many variants to choose from, the crunchy small bread pieces are really satisfying for me. I find it healthy, tasty and delicious all at the same time. Marty's Baconette Strips - My favorite!!! The one thing that I clearly remember during the Ultimate Taste Test 4 was tasting the Baconette Strips chips. Holy molly! It is really yummy! Less the too much oil we see in actual bacon, this snack is a greeeaaaat alternative when you're satiating for real bacon. Go grab one! i love oishi! pillow lover! sana makasama ako sa events nila if ever! @ Philippine Blog Directory: What pods? Grabe, I'm addicted to those baconette strips. That's why I try to avoid them. Haha! You got a huge gift there! Envy! Lol! 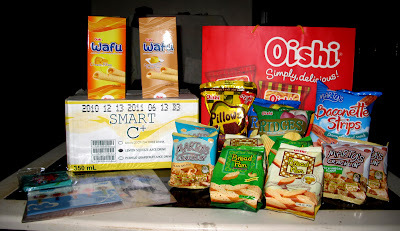 I looove Oishi products too! Love and eat everything on that picture! 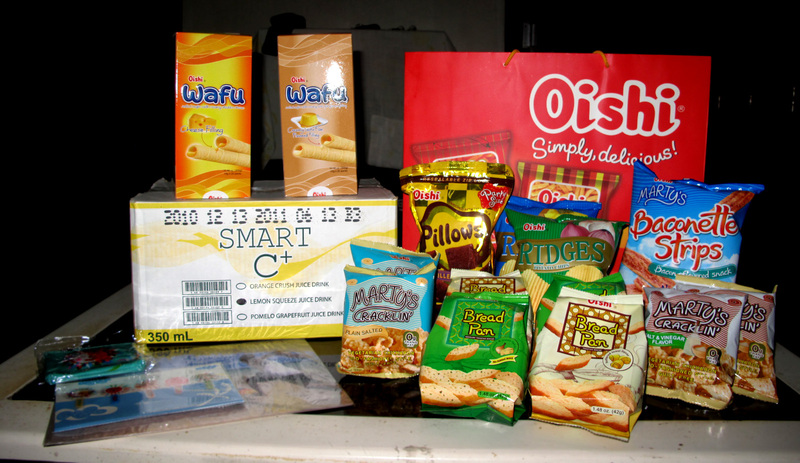 Have to try that Oishi Smart C!